Donald Trump’s polling figures showed little change after last year’s attack on Syria. The 1997 movie Wag the Dog introduced the public to a notion common among pundits and historians, that Presidents like other political leaders might engage in military actions overseas to distract from problems at home. With a President beset from many sides, pundits have opined whether Friday’s attack on Syrian chemical weapons facilities might have been motivated, at least in part, by the same diversionary motive. Friday’s action reprises the Tomahawk missile attack conducted by American forces against a Syrian airfield a year ago. That equally brief sortie had little short-term effect on President Trump’s job-approval ratings and no long-term effects at all. 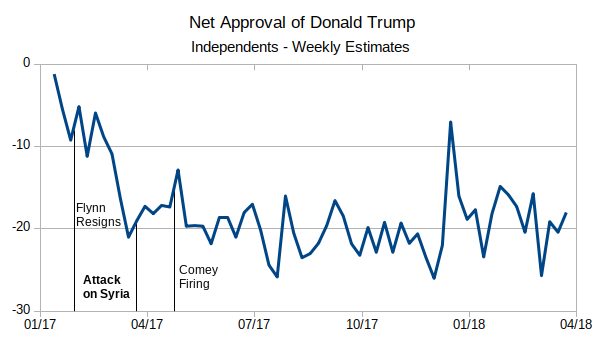 Here is the trajectory for “net approval,” the difference between the percent of American adults who say they approve of how the President is “handling his job” minus the percent who disapprove.1 President Trump has been “underwater” since his Administration began with more Americans disapproving of his performance than approving. 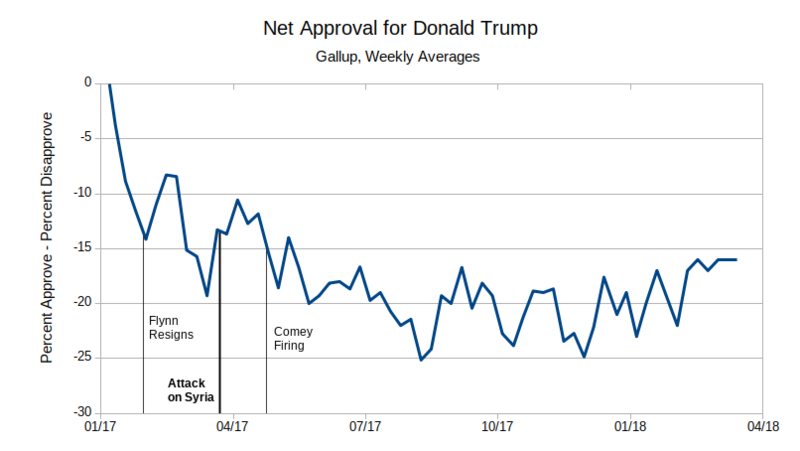 The most optimistic “wag-the-dog” interpretation of this chart might credit a two or three point positive bump in President Trump’s net approval rating after the attack on the Syrian airfield on April 7th of last year. Yet a couple of other prominent events might give us pause. Trump’s approval rating actually improved after Michael Flynn had to resign as National Security Advisor, but it soon fell back down. Last year’s attack on Syria itself took place at a time when Trump’s rating was already recovering. Perhaps the apparent gain after the attack was just the continuation of that trend. When partisans are routinely described as “tribal,” we can hardly expect many of them to change their minds about President Trump just because of a single military attack. Republicans endorse his performance in office by margins of 85-10, while Democrats disapprove by an even greater margin of 9-90 unfavorable. For people so solidly entrenched in their partisanship even a missile attack against a sovereign nation can have little sway. Perhaps, then, we should look at the opinions of self-described “independents.” Maybe their opinions will be more sensitive to current events like a strike on Syria. Sadly those seeking a wag-the-dog effect will once again be disappointed. Independents’ appraisals of President Trump tracked rather closely to the Gallup figures above (with the exception of the weird spike at the turn of the year).2 Again, whatever small gain the 2017 Syrian attack may have imparted to Trump’s approval ratings among independents quickly dissipated a few weeks later. 1Since the beginning of this year, Gallup has reported only weekly job-approval ratings. I appended the 2018 data to the 2017 weekly averages. 2Because Gallup does not report partisan breakdowns, I have averaged together the soundings archived at Pollster that do. This sample includes 313 polls that reported approval ratings for independents. They were conducted by thirteen different organizations, with four each constituting about a sixth of the observations (Politico/Morning Consult, YouGov/Economist, IpsosReuters and SurveyMonkey). ← Can the Republicans Hold the Senate in 2018?